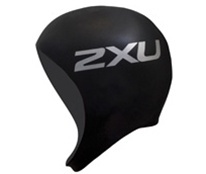 Neoprene cap for low water temperatures protects your head against hypothermia. 100% Neoprene Rubber. I'm one of those people who's ears don't like the really cold water early in the OWS season (disorientation, dizziness etc) and this cap has solved that problem. I ordered the Large / XL and it was still a pretty tight fit. I ended up cutting the chin strap and having a piece of elastic sew in. I think it is more the length of chin strap that was an issue as opposed to the size of the cap portion which feels good. The site was easy to use and my products arrived quickly and as promised. Excellent warm swim cap for the early season. I have using the cap in the Ottawa River this season and it makes a big difference. The only drawback is that it is black therefore its visibility is limited.